London's new Mayor, Sadiq Khan, was elected on 9 May and although his manifesto showed no interest in changing the congestion charge, he has made one of his top priorities addressing air quality in the city. The Transport for London website claims that London breaches EU legal limits on Nitrogen Dioxide (which may not necessarily be a legal matter once the UK leaves the EU, but that doesn't mean there isn't a problem! ), and that pollutants "cause" the equivalent of 9,400 deaths in London per annum. I'm always a little wary of statistical correlations between alleged causes and effects when the actual affects are more likely to be discreet, cumulative and one of multiple factors in accelerating deaths. It is always a good headline, but there is little sense of the historic state of air quality. London has come a long way from pea-soup smog (it wasn't fog) due to coal being burnt to heat households, businesses and generate electricity in the 1950s, with gas heating, energy efficiency, the demise of steam locomotives, relocation of port activities to Tilbury and beyond. Road vehicles are cleaner burning than they have ever have been, although the misguided fiscal encouragement towards purchases of light diesel vehicles in the 2000s (to reduce CO2 emissions) has not helped as low CO2 has come at the price of particulate emissions, which are one of the most serious contributors to respiratory diseases. London has severe congestion, which is a contributor to pollution, because the idling times and low traffic speeds mean emissions per vehicle mile are higher than they would be if congestion were lower. The Mayor of London has decided to consult on using charging as part of a programme to reduce emissions. - All larger vans and minibuses must meet at least the Euro III standard for emissions. The LEZ does not apply to smaller vehicles. Vehicles that do not meet those standards either must be retrofitted to do so, or be subject to a daily charge for driving in London of £100 or £200. It is intended to ensure commercial vehicles in London meet fairly average emission standards. Euro 3 came into force in 2000 and Euro 4 in 2005, so it is not a significant burden to expect most such vehicles to meet those standards. It wouldn't be unreasonable to uplift that to Euro 4 for light commercial and Euro 5 for heavy vehicles by 2020. Yet there is no evidence that the LEZ has had any measurable impact. According to Citylab, a study from two years ago indicates the LEZ has had NO impact. There are some guesses made as to why, such as how newer vehicles may be reducing NOx by less than forecast (and one may also surmise that if there has been extensive fraud in emissions testing by manufacturers, that they are somewhat to blame. Another is that the growth in the number of diesel cars has offset the improvements in heavy vehicles. Of course the LEZ has no impact on that, and the UK Government has only reformed Vehicle Excise Duty (annual registration fees) to remove the advantage low CO2 (diesel) vehicles get from that tax. The fourth, fifth and sixth proposals are nothing to do with road charging, but the other three are, and could have quite a significant impact on the cost of driving in London for vehicles that are not eligible. In addition to the LEZ, the ULEZ had already been confirmed by the previous Mayor Boris Johnson. It is planned to come into effect in just over four years (September 2020) and applies to the whole of the congestion charging zone. It will apply to all vehicles, and those that do not comply face a fine ranging from £12.50 for light vehicles (on top of the congestion charge) to £100 for heavy vehicles. - Minimum Euro 3 for motorcycles and similar vehicles. Residents are meant to have a three year exemption, whereby they do not have to comply until 2023 (they already have a 90% discount on the congestion charge). Separate, but related to the policy is the requirement that all newly registered taxis from 2018 be zero emissions (a policy I think may well have a long term significant impact). The Mayor wants to accelerate its introduction to 2019, which may have a marginal impact, particularly as it is not clear what the impact of this proposal will be in any case. In central London, it should encourage much newer commercial diesel vehicles. Euro 6 vehicles have only been available since 2014. Including cars is more likely to affect both types of taxis (private hire vehicles and hackney carriages) than cars, given they are a significant proportion of such vehicles in central London. On the face of it, the ULEZ effectively doubles the congestion charge for non-compliant light vehicles, so it may have a marginal impact on congestion approaching the zone in the first few years. Although as TfL admitted in a seminar I attended some months ago, even if all cars were removed from central London roads, there would still be significant congestion. There simply isn't enough road space to accommodate the buses, taxis, trucks and vans using central London. So doubling the charge for what are largely average emitting vehicles may make a small difference to congestion and to air quality. For what it's worth, I'm in favour of it. The congestion charge is clearly too low, given prevailing levels of congestion, and this is one way of managing it. The most severe air quality issues are in central London, so this is a sensible move. This proposal is easily the most controversial and it is easy to see why. 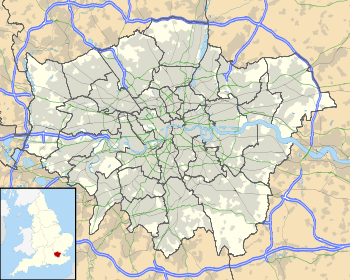 In what appears to be an excessively "quick and fast" idea, the concept put forward is to expand the ULEZ to the entire area of London within the North and South Circular Roads. Those roads are around 6 to 9 miles outside central London, and seem like a convenient boundary as a charge, but all is not what it seems. The North Circular (A406) is, predominantly, a grade-separated highway with 3 lanes each way. It does have four "gaps" at Bounds Green (where the road becomes an at-grade 2 lane street with traffic signals adjacent to housing for people unlucky enough to have to live there), Henly's Corner/Golders Green (where it meets the A1 and plans in the 90s for a tunnel and over bridge, all with planning permission, were stymied by Treasury's lack of enthusiasm for funding road improvements in London, not helped by a Mayor unenthused about road projects) Wembley (where lanes narrow and a traffic light controlled intersection is located adjacent to Ikea) and from Hanger Lane to the M4 (which is not grade separated and varies from 3 to 1 lane each way. These "incomplete" sections are regularly congested of course. The South Circular (A205) is entirely an at-grade network of streets with 1 or 2 lanes each way, essentially a signposted system of roads from the A406/M4 on the western end and ending at the absurd Woolwich vehicle ferry (quite why a major road in London is connected by a vehicle ferry should be a cause of embarrassment, as if bridges and tunnels are technically difficult). 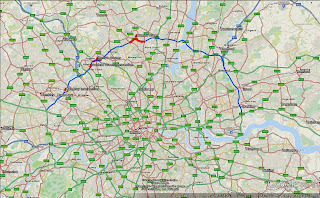 In short, these roads don't form anything like the sort of barrier between outer and inner London, and both cut through residential suburbs in a rather arbitrary manner. The image below depicts both roads. 1. 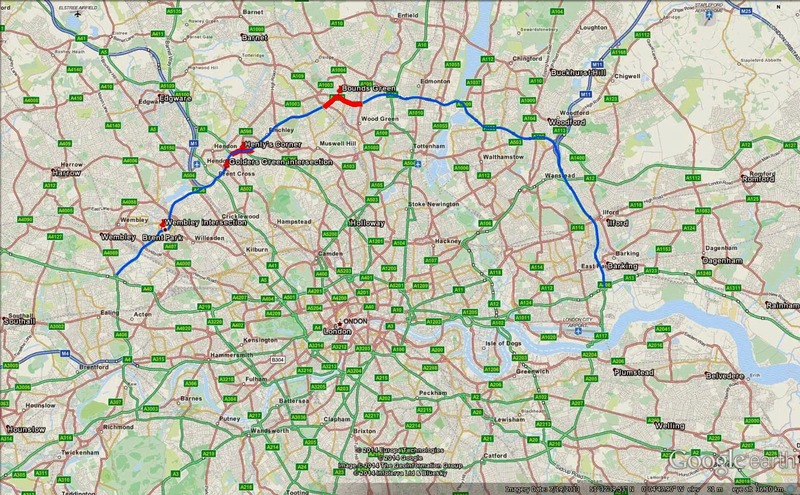 The ring road as it currently exists, is far from being a suitable diversion route for traffic that seeks to avoid the ULEZ. I'd go so far as to suggest that the South Circular (A205) is not fit for purpose, and the North Circular is only partially so. I'd also suggest that if research was done into the air quality along parts of both roads, they would be particularly poor. Bounds Green and Wembley on the North Circular and many locations on the South Circular are residential with severe congestion. This measure is likely to make that worse. 2. Establishing the boundary at this point would be highly arbitrary, and be negative for many small town centres, retail properties and for residents nearby them. It is far from clear that such a boundary will be beneficial to air quality. For example, it effectively segregates Chingford from Walthamstow, which will encourage residents from Chingford to drive elsewhere in outer London, whilst harming businesses just inside an expanded ULEZ. 3. It is far from clear that the main air quality issues in London are adequately addressed by such a blanket measure. A more targeted approach to specific zones may make more sense, e.g. replicating part of the former Western extension as a LEZ may be appropriate to target air quality in parts of west London. A study into where the key hotspots are, and how they might be included, could be more effective, and avoid the outcry of imposing effectively a charge on accessing locations for crossing a partial ring road. I'd also suggest that, regardless, if such a proposal is advanced, it would be prudent to apply it to HGVs, buses and coaches first, not least because with the LEZ, and the central ULEZ, they are best able to transition in the available time (and create the greatest emissions per vehicle), then transition to other commercial vehicles before finally moving to private vehicles. The proposed Emissions Surcharge would parallel the congestion charge both geographically and temporally, so would be effectively a surcharge on the congestion charge. The proposal is to charge £10 more for cars, vans, buses/coaches and HGVs that do not meet the Euro IV and Euro V standards of emissions. Residents, who already have a 90% discount on the congestion charge, would face the same discount on the emissions surcharge. It essentially means that only cars registered no earlier than January 2006, buses/trucks registered no earlier than October 2006 and vans no earlier than January 2007 will not pay. A wide range of users will have exemptions or discounts. Blue badge (disabled) drivers, taxis, private hire vehicles, motorcycles and emergency vehicles will all be exempt or have a 100% discount. Although discounts/exemptions for the disabled and emergency vehicles are all understandable, and the reason for motorcycles being exempt is likely to be a function of technology (as they only have rear facing number plates). Not including taxis and private hire vehicles would appear to be a matter of politics (not wanting to upset the vocal taxi lobby) and administration (neither pay the congestion charge now). Cars, vans and trucks all pay the congestion charge now, so their inclusion is "logical", buses and coaches do not, but Transport for London is responsible for specification of franchises for all local buses, so has this under its control. What it means is that commercial coaches, tour buses and the like will pay, which is not unreasonable. Yet taxis and private hire vehicles are equal contributors to pollution. It looks very much like this is simply a way to avoid a fight with cabbies, rather than being led by outcomes. Furthermore, confining the charge to weekdays 0700-1800 doesn't make any sense other than to link it to the congestion charge. Air quality is an issue beyond those times and certainly on Saturdays, but politically that would be seen as difficult. The final point on this proposal is that it is to be put in place in 2017. That transition time is very short indeed. Given the proposal to impose the ULEZ from 2019 effectively does this (and on a 24/7 basis), and more, in a timeframe that allows commercial and private vehicle users to make a transition, it is far from clear why this proposal is needed at all? London clearly has an air quality problem, part of which is contributed to by road transport. However, it is not clear that the Mayor's proposals are the right response. Introducing the ULEZ a year earlier should not be controversial, but introducing a surcharge in the same area in the meantime (but not outside the congestion charge hours and not including taxis and private hire vehicles) seems less appropriate. Expanding the ULEZ beyond the congestion charge zone is not, in principle, wrong, but to expand it as far as has been suggested seems excessively blunt. It would appear far more appropriate to do a more detailed study on where and when air quality issues, created by road transport, need to be addressed (based on exposure, not just emission levels. Motorways away from residential areas create much less exposure than busy urban streets), then consider what strategies would best address that. I'd go further though, and suggest the Mayor has missed a trick by ignoring congestion as a contributor to emissions. Emissions would drop if he pro-actively addressed major bottlenecks (such as on the ring roads I mentioned) and also looked at pricing for congestion. A radical step would be to propose a pilot of distance charging as a partial replacement of vehicle excise duty and fuel duty, varying by time of day, as a first step towards London vehicle owners shifting towards paying prices to use roads based on capacity and demand. Much previous work on road pricing suggests that significant reductions in delays and emissions can be gained by expanding road pricing on a more disaggregated basis. Charging as a tool to reduce emissions works. It has been used in Germany relatively successfully, and Italy has a long record of urban access restrictions for general environmental purposes. This website has a good long list of such schemes across Europe. It is good the Mayor is recognising the behavioural change potential of charging, although I'd suggest that he is as much interested in revenue as he is in behavioural change (as the UK Government is essentially ending its funding of Transport for London for operational subsidies, suggesting that London needs to raise fares, raise council tax, cut spending, find new sources of revenue or some combination of those). Congestion is London remains severe, the congestion charge doesn't deliver travel time savings that are noticeable for those who pay it. It would be timely for the newly elected Mayor to explore what can be done for congestion and emissions, as relieving congestion will help relieve emissions, generate more revenue, and create significant economic benefits. Although he promised to do little with the congestion charge, there is a long lead time to do what is needed in London - it would be wise to consider more in depth work on the potential for charging, and to slowly groom Londoners into how charging can be expanded and benefit those paying for it. The biggest barrier to expanding road pricing is the opposition of those who will pay, primarily because they don't believe their trips will be quicker and more reliable, and because they don't expect any of the money collected to be spent on improving the roads. Demonstrating that both can be done is, I believe, essential in expanding charging significantly beyond what exists now.